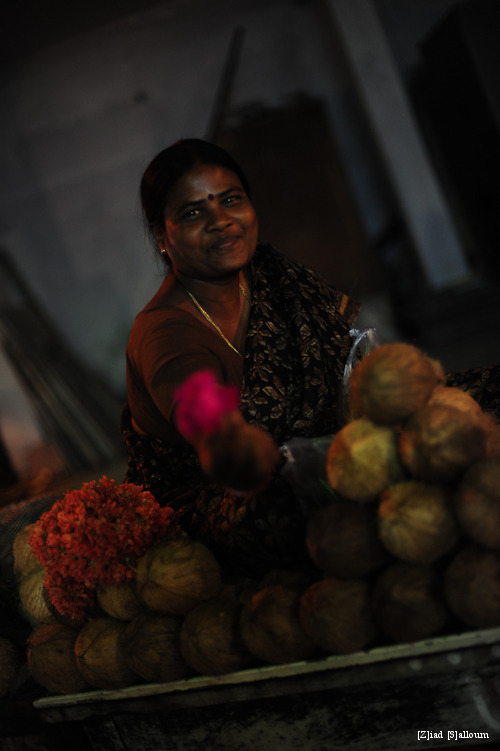 This portrait was made in Hyderabad, India, as I took a stroll in the early evening. Makeshift stalls were everywhere on the crowded streets, with vendors selling their wares as people celebrated the Makar Sankranti harvest festival. To me this picture represents the innate kindness and generosity of people. The small kindness of strangers, and how the smallest of things – a smile – can allow people to open up to others. This lady initially tried to sell me some coconuts, and after a smile and a laugh were exchanged, she handed me a flower as a token of the festival season.